Scorching temperatures on the 1st served as an early omen of things to come in July. Absent were the severe thunderstorms, large hail, heavy downpours, and weather variability that made last July an historically memorable month. Instead, heat and sunshine were the predominant weather ingredients this year. Although such weather is typical of Northwest summers, this year was nonetheless an extreme version of normal. Many areas, including some western Washington locales, experienced a rain-free July. At Mt. Vernon, last month represents only the second month on record (1993 to present) when no precipitation was recorded. For eastern areas, heat was the big story. Prosser's average July high temperature of 92.1 degrees makes it the warmest monthly mean high temperature on record (1990 to present). Overall, July was tied for the second warmest month ever at Prosser, behind only July of 1998. Temperatures were above average in western areas as well, although to a lesser magnitude. Daytime temperatures were particularly warm last month, while generally clear skies allowed night-time temperatures to be only somewhat above average. 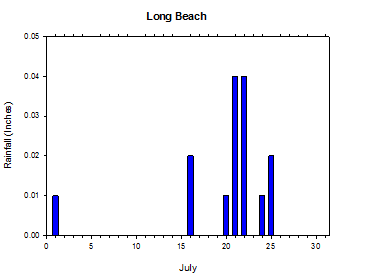 The major headline of the month was the July 1/2 heat wave that sent temperatures soaring as high as 108 degrees. Not only did central Washington record their hottest temperatures since 2009, but the event marked the earliest date of such extreme temperatures since 1992. Otherwise, the theme of above average temperatures continues in Washington, with Prosser recording yet another warmer than average month. One of the highlights of the month was the thunderstorm complex that rolled through the state on the 17th, and brought 0.28 inches of rain to St. Andrews in just 15 minutes. High fire danger resulted from the persistently hot and dry conditions, with a fire starting on Selah Ridge near Yakima on July 5th. Later in the month, conditions became even more critical. A major conflagration known as the Mile Marker 28 fire began near Satus Pass on July 24th, and was aided by extremely dry fuels. However, the Colockum Tarps fire, which began south of Wenatchee on July 27th, quickly surpassed its predecessor in severity. By the morning of the 31st, the Colockum Tarps fire had already burned nearly 95 square miles. The two fires burned a combined total of 130 square miles in only a few days time, leaving a grim legacy in the form of a vast smoke layer across eastern Washington. 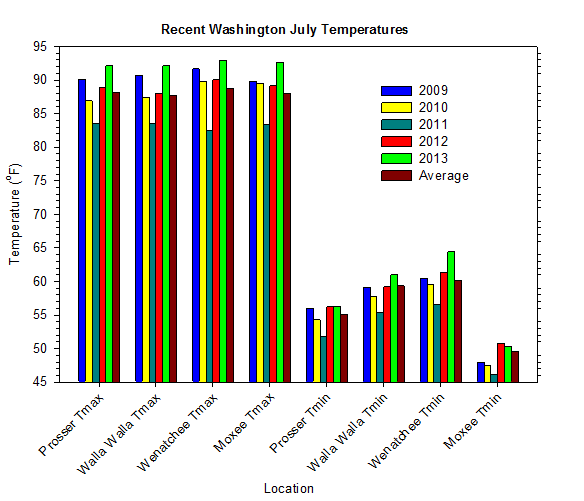 Washington crops generally fared well during July, with the most significant agricultural concerns being heat stress and sun scald prevention. July began with a major heat wave, as temperatures rose as high as 108 degrees at WSU TC and Benton City. Conditions were especially uncomfortable due to the muggy dew point temperatures that reached into the upper 70s in some areas. 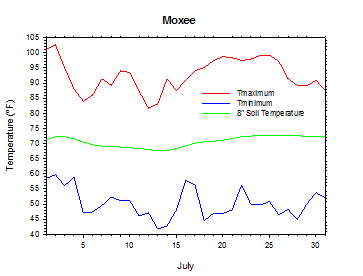 The low temperature at Wahluke Slope on July 1st was a balmy 78 degrees. Excessive heat continued on the 2nd, as Benton City hit 107 degrees, while Wallula recorded a low of 81 degrees! Numerous areas recorded the warmest temperatures since at least 2009. However, you would have to go back to 1992 to find such an intense heat wave occurring so early in the summer. Luckily, cooler and drier conditions arrived for Independence Day, as marine air poured over the Cascades. Highs were in the 80s to around 90 in much of central Washington, with lows in the 50s and 60s. Warming resumed on July 6th, with continued dry conditions. Despite high temperatures in the 80s and 90s in eastern/central areas, lows remained pleasant in the 50s and 60s thanks to relatively dry air. 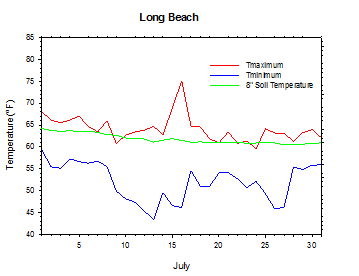 Hot weather briefly arrived on July 9th and 10th, with day-time temperatures pushing 100 degrees in the warmest areas. Widespread 90s were observed across central areas, while eastern and interior western areas reached the 80s. Only the coast remained pleasant in the 60s. Pleasant weather made a brief appearance for July 11th to 13th, as high/low temperatures moderated into the 80s/50s in many eastern areas. 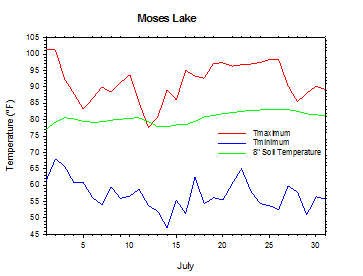 On the morning of the 12th, LaCrosse fell to a chilly 37.6 degrees, and again dropped to 37 degrees the next morning (July 13th). 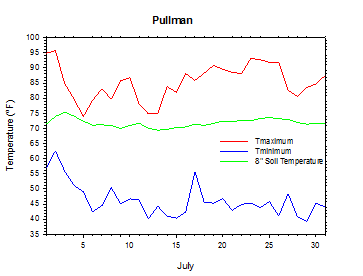 High temperatures as warm as 95 degrees returned for July 14th, although low temperatures at Pullman still dropped to near 40 degrees on the mornings of July 14th and 15th. Scattered thunderstorms occurred on July 16th/17th. St. Andrews recorded 0.28 inches of rain in 15 minutes during a severe thunderstorm, while Chief Joe received more than one half-inch of rain during the storms. Many of the thunderstorms were rather dry, and featured lightning and gusty winds, but minimal rainfall. Heat made a comeback on July 16th, with temperatures as warm as the upper 90s. Low temperatures were mild on the morning of the 17th due to the clouds and moisture. Highs east of the Cascades were in the upper 80s and 90s on July 18th. High temperatures on July 22nd were as warm as 102 degrees at Orondo, and Wallula dropped to a low temperature of just 72 degrees. However, Long Beach topped out at just 61 degrees, while dry air allowed Pullman to drop to 45 degrees despite the generally hot air mass. On July 24th and 25th, the high temperature soared to 103 and 104 degrees at Orondo, as areas east of the Cascades topped out in the 90s to low 100s. Hot weather finally subsided on July 27th, as marine air poured into Washington. High temperatures dropped into the 80s to around 90 in much of eastern Washington by July 28th. 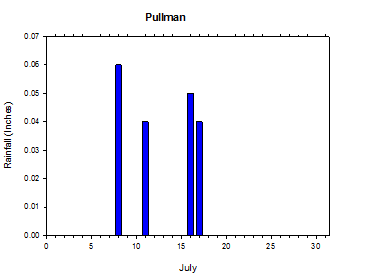 Low temperatures were as cold as 39 degrees at Pullman on July 29th. The average July temperature at Prosser (WSU IAREC) was 75.1°F, which is 2.7 degrees (1 standard deviation) above average. The average high temperature was 92.1°F, which is 4.0 degrees (1.2 standard deviations) above average. The average low temperature was 56.2°F, which is 1.1 degrees above average. The maximum temperature recorded last month was 102.0°F on July 2nd, while the coolest daily high was 82.2°F on July 13th. 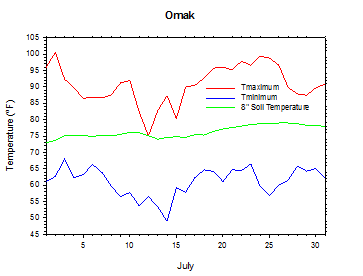 Low temperatures ranged from 68.5°F on July 2nd to 45.1°F on July 13th. Daily average temperatures ranged from 85.3°F on the 2nd to 65.4°F on the 13th. The monthly precipitation total was 0 inches. 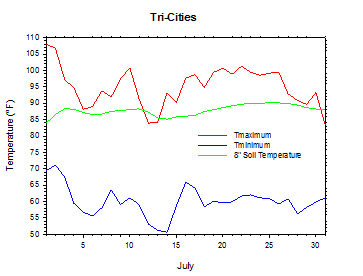 The average wind speed was 3.9 mph, and the average 8 inch soil temperature was 75.0°F. 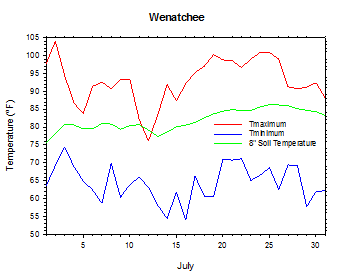 Wenatchee (WSU TFREC) recorded an average temperature of 79.4°F, which is 4.2 degrees above average, while Walla Walla's average monthly temperature of 76.7°F was 2.7 degrees above average. Pullman was one of the cooler spots in eastern Washington, with an average July temperature of 67.4°F. In western Washington, Mt. 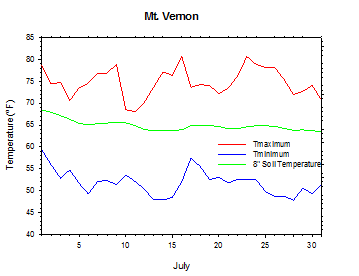 Vernon's average temperature was 62.5°F, which is 0.6 degrees above average. July 1st: The temperature at Benton City soared to 108 degrees. July 2nd: The low temperature at Wallula was a balmy 81 degrees. July 13th: The temperature at LaCrosse dropped to 37 degrees. July 17th: 0.54 inches of rain fell at Chief Joe. July 25th: The temperature at Orondo climbed to 104 degrees. Hot weather early in the month spurred many crops toward maturity, as winter wheat neared harvest. In Grays Harbor County, berries rapidly ripened, while raspberries in Thurston County reported sun scald. However, the heat helped to eliminate mold on Whatcom County raspberries. In the Yakima Valley, early nectarines, peaches, and apricots were harvested in early July, while Adams County corn was helped by hot temperatures. During the second week of July, winter wheat and potato harvest began. In the Yakima Valley, the apricot harvest peaked, as the raspberry harvest neared completion, and other fruit and vegetable harvests continued. In western Washington, pumpkins continued to grow well in Grays Harbor and Snohomish Counties. During the third week of July, some hail damage was reported on the winter wheat crop in Grant County, although the harvest continued normally in Lincoln County. In the Yakima Valley, thinning and protecting apples from the heat were the most significant occurrences of the period, while late harvest sweet cherries looked good. As of July 29th, winter wheat harvest continued in Whitman and Lincoln Counties, while spring wheat harvest commenced in Adams and Franklin Counties. Potatoes and sweet corn were harvested in Franklin County, while potato harvest approached in Adams and Spokane Counties. In the Yakima Valley, peach and nectarine harvest continued, while berry harvest proceeded in Whatcom County. In western Washington, winter squash looked good, while pumpkins grew rapidly in the very warm weather (National Agricultural Statistics Service). 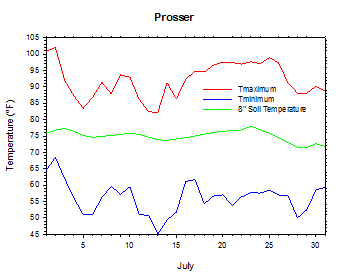 On July 3, 1999, the temperature at Prosser (WSU IAREC) dropped to a monthly record cold value of 38.7 degrees. According to the Climate Prediction Center (CPC), above normal temperatures and near normal rainfall are expected in Washington during August and into the early autumn. Later in the autumn, near normal temperatures and above normal precipitation is possible, especially for northern Washington. It appears that ENSO neutral conditions are most likely for the winter of 2013/2014.